In majority of applications of Industrial Automation we need to connect Rotary encoder for feedback purpose. We need to use high speed inputs for connecting the encoder output wires. 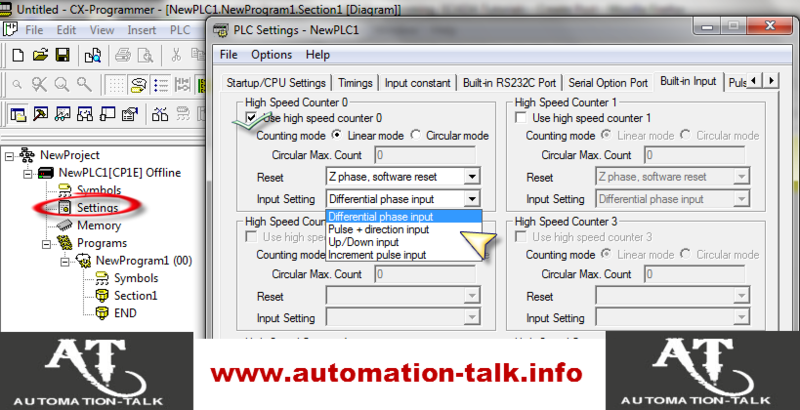 Also we have to define the high speed inputs in the PLC Programming software. Also the High speed Inputs are required for connecting the Input signal which have very high switching frequency. Now let us see as how we can define high speed inputs in Omron PLC. CX- Programmer is the PLC Programming software used for programming of Omron range of PLC. If you are using High Speed Counter Inputs for Interfacing of Omron Encoder with PLC. then first connect the encoder with PLC properly. Now open CX-Programmer and start a new project. 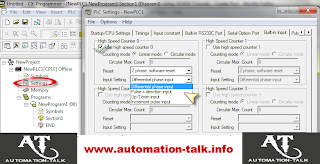 After this in the left hand side of project workspace you will see settings option , double click on that and open , now here you will see many tabs , go under the Built-in Input tab .Here you will see High Speed Counter 0 to High Speed Counter 6. Select the High Speed Counter accordingly as per the connection of encoder. Now in the type of Input setting you can select as Differential Phase Input OR Up down Input if you want pulses to increment in CW direction and pulses to decrement in CCW direction. Note :- Click on the Picture for enlarged view. Also you can select Pulse + or Increment Pulse input if you want that number of Pulses should increase in both the CW and CCW rotation. A full PLC Program Using the Omron PLC made in CX- Programmer for Interfacing of Omron Encoder with PLC for a sample application has already been discussed. So through above method we can use high speed counter and connect the devices with giving high frequency output. Also you can subscribe to get all latest updates of PLC Programming , SCADA Tutorials and VFD Application in yours Inbox.